Red Skin Suit Adult Costume.Includes: One Red Skin Suit. Available Size: Adult - Standard. (See Size Chart For More Information) *Shoes and Accessories Not Included. Sold Separately.Bring a cool and mellow attitude to the party in our Red Skin Morph Bodysuit Costume. It is a red full body suit with a red hood attached. This one-of-a-kind full body suit is designed to cover you from head to toe while allowing you to see through them. Great for both men and women, they allow you to be completely anonymous and nobody will have any idea who you are since they can't see any part of you! 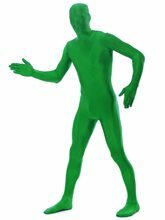 This unique and stretchy costume has become very popular at sport and social events as well as holiday celebrations. Our Red Skin Suit Adult Costume is a stretchy polyester morphsuit designed to allow easy breathing and visibility with a zipper in back for quick access in and out. You can transform a morphsuit into a complete different character with the use of accessories.